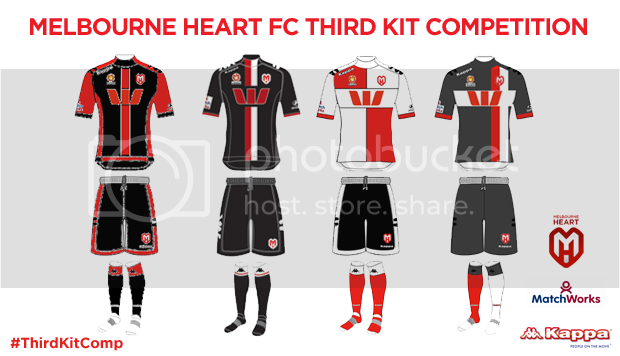 Check out the four finalists of the Melbourne Heart FC Third Kit Competition, which sets the exciting challenge for members to create a uniquely-designed Melbourne Heart FC Third Kit. Check out the four finalists of the Melbourne Heart FC Third Kit Competition, which sets the exciting challenge for members to create a uniquely-designed Third Kit for the Red and White. The Third Kit encapsulates the Club-s values, spirit and connection with its fans and membership base and these four entries are sure to resonate with our fans and members. The Club seeks a professional design, which will fit with the same look and feel as our home and away jerseys, evoke the passion from the fans and encapsulate the ideals and values of Melbourne Heart FC. Kappa will manufacture the winning entry, while the Club-s sleeve sponsor, MatchWorks is the primary sponsor and driving force behind the competition. The winner will be announced in December and will also receive a copy of their self-designed strip, signed by the first team. The finalists will be shown to Head Coach John Aloisi and our captain Harry Kewell, who will select their favourite design. The Club will wear the kit on January 17 next year at AAMI Park against Newcastle Jets in Round 15 of the Hyundai A-League to celebrate the Club-s 100th Hyundai A-League match. The four finalists, above, will be considered by Head Coach John Aloisi and captain Harry Kewell. The unique design will feature the name of every 2013-14 member who signed up before Friday 20 September 2013.